DeMi Cell represents principles of action of the so-called regenerative fuel cells (RFC). This type is considered as very promising as it combines the functions of electrolyzers and fuel cells. When supply with external electric power, the device works as an electrolyzer splitting water into gaseous hydrogen and oxygen. In reverse, when feed the anode and cathode with hydrogen and oxygen, respectively, a spontaneous electrochemical reaction takes place, which chemical product is only water, but also electricity and heat are generated. This dual action of regenerative fuel cells is possible due to the use of bi-functional electrocatalysts, which accelerate in a reversible manner the electrochemical conversion of hydrogen and oxygen. Although our prototype does not contain noble metal electrocatalysts, as the real systems do, it is able to work consequently as an electrolyzer and fuel cell, thus demonstrating the principles of action of regenerative fuel cells. In addition, our model possesses also the function of gas-holders that store the gases generated during electrolysis till the subsequent operation as a fuel cell. Thus, in reality, you may operate with several devices – an electrolyzer, hydrogen and oxygen gas-holders and a fuel cell, collected in one module. - the design of the device to be comparatively easy for implementation and to ensure good observation possibilities of the occurring phenomena and processes. DeMi Cell consists of two removable parts – transparent body and lid, on which two electrodes with separators and connectors are assembled. The transparent body is filled with aqueous solution of non-toxic and non-hazardous oxygen-containing salt (sodium bicarbonate, for example), in which both electrodes are immersed. The electrodes are made of a metal mesh used as a current collector and non-precious metal catalysts. They are put in special bags that serve as separators and gas-holders at the same time. The oxygen and hydrogen, needed for the fuel cell’s operation, are obtained inside the cells through water electrolysis, carried out via supplying external voltage out of a proper photovoltaic element (LeXsolar solar module) or an ordinary 9V battery. Thus, the model can be used both for demonstrating principles of operation of electrolyzers, powered by solar energy, and fuel cells. The prepared in that manner fuel cell ensures powering up small electronic devices, such as light emitting diodes (LEDs), digital displays, etc. Several cells can be connected in series thus obtaining higher voltage (proportional to the number of cells) and demonstrating the principle of stacking used in the real fuel cell systems. DeMi Cell can be used both for demonstrations and labs performed by students. 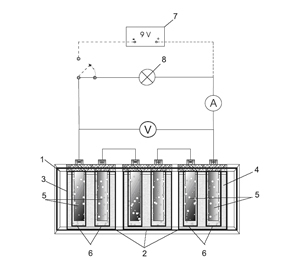 Stack 1 of three connected in series DeMi Cells 2 operating as a fuel cell supplying a load 8 (solid contour) or as an electrolyzer (dashed contour) charged by an external power supplier 7: 3- transparent body, 4- electrolyte, 5- electrodes, 6- separators (gas-holders).